Dani Bates is a weight loss coach based in Bellingham, WA. 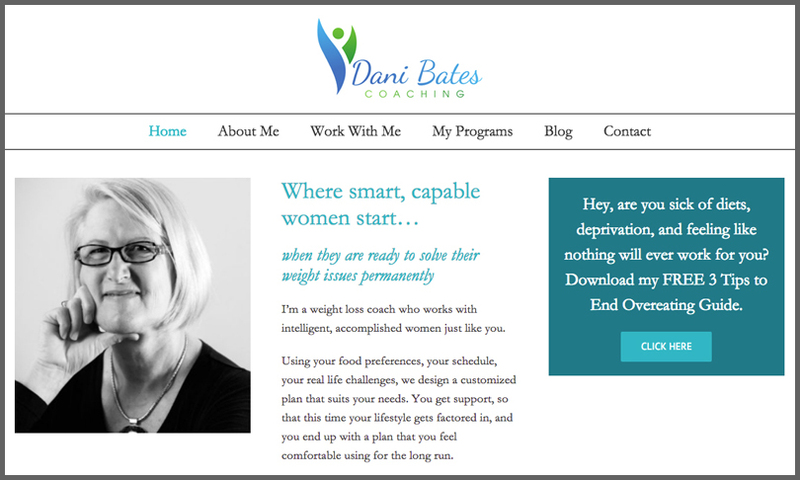 She and I just worked together to give her Dani Bates Coaching website design a fresh new look. Dani works one-on-one with her clients to resolve the weight-loss issues they have faced for years. Rather than diets, Dani focuses on the underlying issues involved with managing ones weight. We defined her audience: accomplished, intelligent women, and refined her message: that she can help them make lifestyle changes that will help them lose weight, permanently. I wanted to convey Dani’s sophistication and sense of style, so I kept the website design light and simple. Her blogs show her playful side, and keep the site fresh, always a plus for search-engine optimization. Take a peek at https://danibatescoaching.com.